Summer days are definitely on the way if these beautiful spring days are any indication – well in the Wairarapa anyway. Planning Christmas and New Year holidays are high on the agenda. People are upgrading their RVs to later models, or perhaps buying their first RV ever. Camping is almost a precursor to an RV lifestyle, and tents and camp trailers were popular exhibits at the recent Mystery Creek NZMCA motorhome show. Wherever you are at in the process – dreaming of an RV lifestyle, or already living the RV lifestyle – we are here to inspire you. Join us in our RV lifestyle with Caspar and RocknRobyn Chronicles in every issue of RV Travel Lifestyle magazine. Photographs South Bay Kaikoura, start of the Peninsula Walkway looking back over the bay. At Covi NZMCA Insurance we offer the highest level of cover for your RV and we’re proud to be the only insurer that reinvests back into our industry via the funds returned to the NZMCA each and every year. We are also constantly looking for ways to add value to our customers. Earlier this year it was our upgraded Wings Roadside programme; now it is the launch of Covi Advantage. Launched on October 8, Covi Advantage is a discount programme exclusive to Covi customers. We’ve partnered with relevant businesses to offer discounts to our loyal customers and this means cheaper RV-related products and services for you. Masport – distributor of the Ziegler and Brown range of BBQs in NZ, portable and perfect for your RV. The potential savings for Covi customers are substantial, and as our suite of partners grows over time, so will the opportunities for you to save. At Covi, we are proud to be supporting our growing industry and working collaboratively with New Zealand-owned businesses within it. We’re excited to be introducing these benefits and look forward to hearing feedback regarding other businesses you’d like to see us partner with. To enjoy the benefits of Covi Advantage, all you need is your current valid Covi client number (starting with CL). Details on the discounts and how to redeem will be sent out in your next renewal pack. In the meantime, if you have just renewed or you want to find out more about our partners, the discounts on offer, and how to take advantage, simply email covi.advantage@covi.co.nz. RV Supplies announces acquisition of distribution rights for Truma products in New Zealand. Hamilton based importers and distributors RV Supplies Limited is pleased to confirm earlier verbal advice that it has been appointed to represent the global brand Truma in the New Zealand market. The development follows a change at the end of June in Truma’s distribution arrangements here and in Australia. Truma are recognised globally as a leading provider of appliances to the RV and associated industries. They are pioneers in the development of heating equipment; their air heating products have been the principal choice of manufacturers in the European markets for more than 30 years. In addition, they have developed innovative water heating and more recently air conditioning products to address the needs of motorhome and caravan users everywhere. Recently they have led the industry in the adoption of new technology products based around connectivity, and promise more focus on this growing sector. Their global status has been reinforced with the establishment of full service and technical facilities in the United States. In Australia, Truma products will be distributed by a new entity called Leisure Tec Pty Limited who will work closely with RV Supplies Limited on a range of new initiatives and other product developments. “A strategic alliance with Leisure Tec in Australia will also afford us further new product opportunities and most importantly provide us with a new and reliable channel of distribution in Australia for a number of the product streams we already possess. “There will be further new product announcements in the course of the next few weeks as some of our short-term plans come to fruition”. From this week, those exploring SH2 by motorhome or campervan will have a new site to fill water tanks and have access to a dump station. Tui Brewery, located in the Tararua township of Mangatainoka, has just opened a new dump station for motorhomes and campervans either visiting the brewery or staying across the road at the Mangatainoka Reserve. Open during brewery hours, the dump station and water filling station will provide another alternative for those travelling north or south along SH2 – a popular touring route linking Hawke’s Bay with Wairarapa and Wellington. The dump station is an extension of the Plants and Pints initiative Tui implemented in 2017, which saw staff gift a native tree for visitors staying at the reserve to plant there. Since then more than 1000 natives have been planted along the banks of the river and within the reserve. Tui Brewery’s onsite nursery has been a hive of activity with staff planting more seedlings to keep up with demand. The Tui Brewery team has also made improvements to the picnic tables, pathways and driveways in the reserve using funds raised at their various events. “The Mangatainoka Reserve is located on the banks of the Mangatainoka River, the main water source the brewery uses in making its beers,” says Rosie Rogers, from Tui Brewery. Rosie also encourages those staying at the Mangatainoka Reserve to pop across the road to the brewery and enjoy lunch outside in the garden bar and do a brewery tour, which traces Tui’s 129-year history and includes a visit to the state-of-the-art brewery. More details on www.tuihq.co.nz. DON’T GET CAUGHT OUT. Daylight saving is here and the rain is getting warmer, so it is time to make sure your vehicle is functioning correctly before the holidays arrive. As summer approaches, AA Solar in Silverdale are getting busier as more customers book in their RVs and Caravans to have their batteries and charging systems checked, and ensure their solar power systems are properly set up before they set off on holiday. This popular service usually only takes about 90 minutes and includes a visual inspection, a check of system settings, and testing of your motorhome power system. If possible, any problems can be fixed on the spot, and this will help avoid the disappointment of things going wrong in the middle of the holiday. This is also a good time to discuss with the AA Solar staff how well your system has been meeting your needs, or any technical problems you may have been having. It can also be a really good time to consider accessories such as TVs, satellite and Wi-Fi antennae, fridges, vents or lighting upgrades. Held over the weekend of September 21–23 the NZMCA Motorhome Caravan and Leisure Show enjoyed fantastic weather, record crowds and over 1200 motorhomes came to stay in the Event Park and Stay area, some for just one night while others took advantage of the opportunity and stayed for three days and explored all that nearby Hamilton had to offer. This show has always been popular, being held in Spring when people start turning their thoughts to summer road trips, upgrading or buying their first RV be it a caravan, motorhome, camper, trailer or tent. This show was the second with the NZMCA as the naming rights partner to the long-running event, the first being the July Christchurch show earlier this year. The event organisers, Classic Events, thanked and acknowledged their new naming rights partner, the NZMCA, as their support proved instrumental in this weekend being the most successful September Show yet, and they look forward to a long and happy partnership with the NZMCA and the RV industry. Organisers say the growth of the show meant the pavilion was sold out months in advance, requiring them to build the ‘Off the Beaten Marquee’, which housed the destination zone as well as a huge number of accessory and other exhibitors. There were record numbers thru the gates each day, particularly Friday and Saturday, with an official total of 18,300 attending over the weekend. 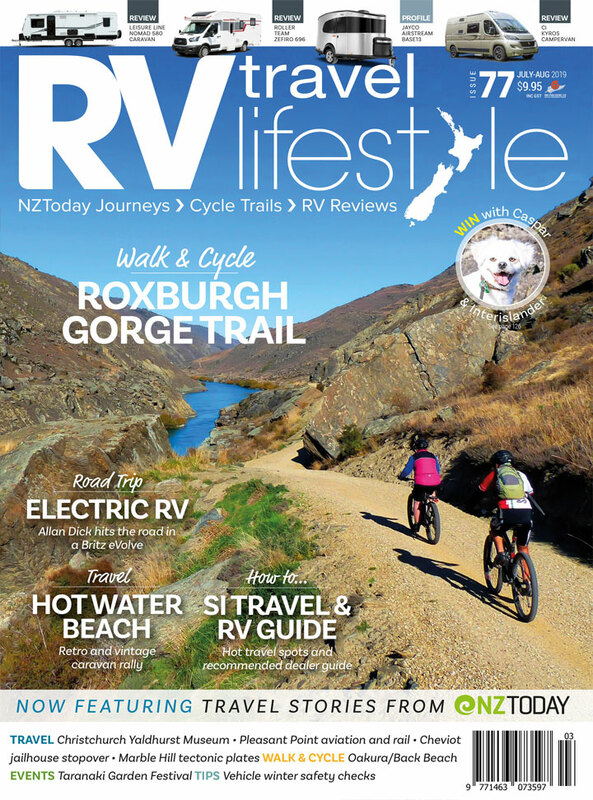 RnR Publishing had our RV Travel Lifestyle, NZTODAY and NZ Classic Driver magazines for one-off sales and new subscriptions, and as always it was fantastic to catch up with so many of our readers. These events are a blessing for seeing our ‘RV family’, both readers and our fellow industry friends. We were really pleased with the weekend and had record subscription and magazine sales for this show, a reflection of the number of people seeking out the RV lifestyle. We welcome over 120 new subscribers to our RV family. Caspar was also allowed to be on the stand this year, which proved to be very popular. Look out for his column in RV Travel Lifestyle Issue 73 early November – he will have photos of his favourite visitors. The recent motorhome show was packed with new models, both New Zealand-built models,as well as a plethora of imported ones. RV Leisure Centre in Nelson featured the under-6-metre Elddis Accordo two-berth model. DeLuxe RV Group in Blenheim could hardly contain the crowds trying to see the Winnebago Iluka motorhome, and families flocked into the Dethleffs Camper caravan – they loved the bunk bed options. Hot off the boat at RnRV in Silverdale, the latest model Carthargo ‘Liner for Two’ has arrived for summer. Price: $132,995 including Auto Satellite dish, 22” TV/DVD, 160w solar panel, Reversing camera, bike rack and choice of tow bar or awning. This compact model ticks all the boxes for those looking for an RV for two in the under six-metre range. This model boasts the revolutionary ‘Strong-Lite’ high-strength aluminium one-piece sides in ‘Azure Blue’ (touted to be 40% stronger and 30% lighter than current other models). Based on the Fiat ducato 2.3L 130bhp Turbo diesel, front-wheel-drive chassic and popular automatic transmission. This is a compact RV made for weekends away and easy around-town driving and parking, but packed with everything you need for comfortable living. Habitation entry door is on the left (kerb) side of the vehicle. Stepping in directly behind the passenger cab seating you have the kitchen bench to the right, the combined toilet/shower en suite area opposite, and at the rear is the living/lounge/bedroom area which converts to whatever is peferred – two single lounge seats become two single beds at 1805x705mm, or can be made up to a large 1405 x 2010mm bed as required. The kitchen offers a three-burner enamel gas hob with cover for extra work space, combination gas grill and oven under the hob, durable ‘Karnak’ granite-effect worktops, a 95L fridge with removable freezer unit (below the sink), and overhead microwave and kitchen storage lockers with LED lighting. Water wise there are 70L fresh and grey water tanks and an 8L Whale Expanse dual-fuel under-slung water heater with 4kW Whale ducted heating in living and bathroom spaces. Under 3500kg GVM, Tare 2568kg – payload 732kg. Measuring up at 5999mm long, 2600mm wide (2000mm interior), 2725mm exterior height (1930mm interior). Price – model viewed at show $194,990 (show special). DeLuxe RV Group from Blenheim had the latest Winnebago Iluka 7900mm motorhome on display. Built on the Iveco Daily 50C17, 8-speed Hi-Matic auto, rear-wheel-drive chassis, powered by a 3.0-litre, 4-cylinder, 170hp/125kW engine with variable-geometry turbocharger and intercooler. Boasting a huge payload of 1305kg, this model offers great indoor space, excellent exterior storage, is on a COF, and standard car licence to drive. This Iluka model has the popular separate rear bedroom with queen island bed (1880x1530mm), plenty of storage, separate toilet en suite and shower mid-ship between bedroom and the kitchen service area. The lounge-dining area is behind the driver’s cab, and both cab seats swivel for extra entertainment seating. Lots of great internal features, including a 190L, three-way auto fridge/freezer unit; classy Thetford induction hob as well as a gas-powered two-burner hob, grill and oven to take care of cooking; hot water provided by a Truma Ultra rapid gas/electric system and the heating by an Eberspacher diesel system; 100L fresh and grey water tanks; two 20″ HDTVs, one in the lounge, the other in the bedroom. The over-cab Luton is the second large bed at 2250 x 1350mm. This model is also available to order with two single beds in the rear. Windows are double-glazed acrylic with built-in privacy blinds and fly screens. On the outside: electric entry step and wind-out awning (5000mm x 2500mm); BBQ gas bayonet fitting, hot and cold shower fitting, LED awning lights, exterior aerial outlet, Fusion marine grade speakers, USB charge outlet, colour reversing camera with 5″ LCD monitor and more. Two 100Ah deep-cycle, fully sealed house batteries, plus 150W solar panel and regulator, and BMPRO battery management system with 25-amp battery charger. Storage: tunnel boot 1050L with 42x57cm access both ends, plus a 100L driver-side locker with 59x26cm access. External dimensions (mm): length 7906 x height 3151 x width 2450 (excl. mirrors). GVM 5200kg, Tare 4495kg, payload 1305kg. Central RV are based in Taupō and are the distributor for the German-built quality Dethleffs caravan range. Dethleffs have a range of family-friendly caravans with bunkrooms for the kids at one end, and a separate bedroom for the adults at the other – perfect. The Camper is a six-berth model based on the single-axle AL-KO heavy-duty chassis with ATC trailer control system, AKS anti-sway coupling, AAA self-adjusting brakes and Octagon shock absorbers; well set up for travel on our roads, and well built with GFK composite construction, fully insulated floor, roof and walls, and double-glazed tinted trapezoidal windows. The habitation entry door is on the right side towards the rear. Stepping inside, the twin-bunk bedroom area for the kids is directly to the left in the rear. The mid-ship area has a large U-shaped lounge/dining area (on the left) that converts to a large double bed, and the kitchen runs down the right side, opposite. The front third of the van has the fixed French bed on the left and a long side bathroom on the right with separate shower, vanity and pedestal electric-flush cassette toilet. With a family of six on board you will need plenty of water; this model boasts 160L fresh and 145L grey on-board monitored tanks. A Truma 6kW gas/2kW 230V heater and separate gas/electric hot water system takes care of heating and washing. The 142L auto three-way fridge/freezer will take the family food no problem at all. This model boasts a 160W solar panel, MPPT solar controller and management system to feed the AGM deep-cycle battery, large skylights, soft-close drawers in the kitchen, indirect ambience lighting. Dimensions (mm): Length body 6750 – overall 8180mm, width 2500mm. GVM 2000kg, Tare 1580kg – 420kg payload. Front bed size 2000x1600mm, bunk beds 1900x700mm. This is just one model and floor plan. Dethleffs caravans start with the budget-friendly 5310mm body length C’go models (1500kg GVM), right up to the large tandem-axle Exclusive luxury models at 8050mm long and 2800kg GVM. RnRV in Silverdale, Auckland are proud to be able to present, early in the new year, Carthago’s latest innovation and superior model, the ‘Carthago Liner for Two’. Carthago motorhomes are renowned in Europe for their high level of quality, innovation and expertise of craftsmanship. This model boasts a spacious U-shaped lounge in the back and magnificent drop-down bed in the front. On top of these highly desired features, the Liner for Two is available to order with either a Fiat Ducato base vehicle or a rear-wheel-drive Iveco base vehicle (with the option of ‘diff-lock’). This Carthago model is already proving very popular in Europe and we know it is going to be a true winner in New Zealand. A Carthago motorhome is something special; it is not a motorhome from the shelf. It is a synonym for exclusiveness and quality! Discover the sophistication in detail, the unique design, and the incomparable charm of the most successful integrated motorhome in its class. The Carthago personality is distinctive, unmistakable and unique: a Carthago is THE face in the crowd. It is just as individual as its owner! Take a look at the Liner for Two in this attached YouTube video, vehicles now available from RnRV at 66 Small Road Silverdale, Auckland. National Gardening Week returns October 15–22, and to celebrate we would like to offer you the chance to win with our giveaway of a fabulous Yates National Gardening Week Starter Hamper with everything you need to get gardening – valued at $100. Click here to enter. Contents include Nature’s Way organic seed-raising mix; Thrive natural fertilisers and a bunch of new season’s flower, fruit and vegie seeds, including special seed mixes to attract butterflies and bees to your garden. Our Monarch Butterfly is under threat, and this National Gardening Week Kiwis are being called upon to plant butterfly-friendly plants to help save the caterpillars when they hatch in spring and summer and provide nectar for butterflies. A national planting day will be held on October 20. Plant a swan plant or other butterfly-friendly plants in your garden, in your neighbour’s garden, at school, in your local community garden – and let’s help Monarch butterflies flourish. Flourish celebrates the endeavours and achievements of women gardeners who are responsible for some of the most admired gardens within New Zealand. Scattered from the far north to Stewart Island, these gardens have a few things in common. Each one has been developed by a woman responding to her own landscape and locale with energy and verve. Often an outlet for a creative urge, the gardens portray a wide cross-section of styles, from coastal spreads to courtyard gardens and native bush to rose gardens. The stories of the gardeners also share common bonds – hard work and a passion for the landscape – but also stories of combating isolation, loss and joining a sisterhood of gardeners. This is New Zealand’s iconic wine celebration, weaving together the best of wine, food and music to create an unforgettable day in the vines. Win one of two double passes here. Good wine is always in vogue and Toast 2018 is no exception. The 27th edition showcases nine vineyard sites and some of the best chefs in the business to offer wine and food matches of unrivaled flavour and sophistication, supported by a collection of musicians guaranteed to have everyone singing, dancing and laughing. No matter how festival goers want to layer their day – whether it’s ticking off the bubbles bars, comparing the new release wines, or trying some older vintages – Toast has every option covered, thoughtfully paired with the perfect food match of course. Experience the unique atmosphere of each vineyard by riding the free shuttle buses continuously circling the route, or follow the thread of people making their way on foot. Whatever the destination, a warm welcome awaits, so grab a glass of something delicious and enjoy discovering each piece of the rich fabric that makes up the Toast experience. Toast Martinborough 2018, Sunday November 18. Is the Cycle Trail Finished Yet? Not a Rail Trail (Cycle Trail Tours from Queenstown) share this excellent advice with trail cyclists – read here. Nga Haerenga, The New Zealand Cycle Trail, started with an idea to build a network of easy cycle trails to allow Kiwis and visitors to see more of rural New Zealand and generate economic, social and environmental benefits for these communities. Cyclists who have ridden only the Otago Rail Trail, the first of the multi-day cycle rides, may have the expectation that the new cycle trails will be easy and 100% off road. But, the reality of these new trails, and how they’re marketed, varies widely. As a cycle trail tour company, we’ve found that this causes massive confusion. The fantastic Alps 2 Ocean Trail, our longest, is being continually improved yet is still around 40% on road; nevertheless, the Waitaki District Council do a great job of promoting it worldwide. Contrast this with the equally amazing Around the Mountains Trail that has a similar surface breakdown, but the Southland District Council have chosen not to promote the trail because ‘it’s not finished yet’! Nathan Butler has been the face of New Plymouth’s Merit RV since the family business opened its doors in 2003. Nathan is the respected vendor of high-quality new and second-hand recreational vehicles. His integrity can be seen in the high number of return customers who Nathan says frequently drop in to see the team when they pass through New Plymouth. Nathan credits a great deal of the return custom to the brands his company sells and the service their team provides. Merit’s long-established relationship with Swift Group UK enables the company to buy Swift’s Kon-tiki, Escape, Sterling, Sprite and Bessacarr brands direct. Swift is, of course, the largest recreational vehicle manufacturer in England, and Merit RV is the exclusive dealer for the Swift Explorer range of caravans and the Swift Voyager range of motorhomes. Nathan says that since the relationship began, Swift has fulfilled their requirements for well-manufactured vehicles that stand the test of time. “We’ve been dealing with the new Swift products for over 10 years now. It impresses us that Swift spends a lot of money on research and development to refine their product, and to keep them at the top of their game. That certainly gives us the confidence to know we’re dealing with one of the best in the World,” Nathan explains. Another service the company offers is a two-day handover where buyers of brand new RVs stay at a nearby campground (courtesy of Merit) while receiving a comprehensive handover as they become accustomed to their new vehicle. It’s all part of the package and demonstrates that good service and return custom are inextricably linked; when it comes to Merit RV, customers who arrive as strangers become friends. For more information, contact Merit RV. Nathan Butler: 021 179 1164. Ken McLean: 021 552 100. Is your demand bigger than your supply? We asked Greg at Redarc what monitoring systems offer consumers. The ever-expanding range of gadgets available for recreational vehicles raise questions of priority (which should I get first?) versus necessity (do I need it at all?). A house battery, sometimes called a leisure, auxiliary or secondary battery is an essential part of your RV and some people can get away with leaving it to its own devices. But more demanding users really need to be aware of how their system is going during their adventures, to be sure they have power when they need it, as well as ensuring optimal performance and service life of their auxiliary battery. This is where the question of ‘needing it at all’ is relevant. Some level of battery monitoring can give peace of mind especially when that battery is something that you rely on for safety or necessities. If you know nothing about the battery condition (through lack of monitoring) then the only way to find out is the hard way – when it’s flat! There are various ways that batteries can be monitored from simplistic voltage and current readings, right through to using these measurements in conjunction with battery chemistry and size characteristics. Voltage measurement is the entry-level battery monitoring solution. Whether a hardwired gauge or wireless solution is employed, it will essentially tell the user the instantaneous voltage of the battery at any given time. Voltage can give you a line in the sand from which you can judge if things are behaving as they normally do. If the voltage is higher than the normal rest voltage observed, then you know the battery is charging. If the voltage is lower than normal rest voltage, it is under load or in a discharged state. Learning what is normal for the particular installation is the best way to understand its behaviour and limitations and know if everything is ok, bearing in mind that voltage is influenced by charge/discharge and rest periods. Noticing that something is abnormal is your indicator that something is going wrong. There are rules of thumb around battery voltages as a guide to the state of charge, but the battery data sheet will give more detail. Different battery types, sizes, temperatures, charge and discharge rates will all alter the battery state. More-useful information is provided by combining measurements of voltage and current, because current flowing into or out of the battery will influence its voltage, and the amount of current flowing affects the voltage change. The internal resistance of the battery (which depends on its condition) is another of the key factors that determines the voltage change induced by this current flow. What this means is that you can have a better understanding of the battery condition if you also have information about the current flow. If the voltage is low despite a very high current flow into the battery, you know it is deeply discharged and will take quite some time to charge. If the voltage is high and the current flow into the battery is low you know the battery is nearly full. On the other hand, if the battery voltage is high and so is the current flow into it, there may be a battery fault. Conversely, if the voltage is low and so is the current flow, there may be a charging system fault. Current and voltage measurements of this kind are used in more than the aftermarket for our viewing pleasure though; vehicle charging systems are now more aware of this activity in the electrical system and use the information for precise control and diagnostics. Inductive current sensors in the charging system, commonly fitted on the battery negative lead, deliver information to the vehicle control modules about the current flow to tell if the same amount has been delivered as was taken (to determine battery health), and to tell if stop/start systems can be operated without the risk of not being able to start the car again (if the battery is still taking a lot of current it must be in a discharged state). From the RV owner’s point of view, a battery monitor incorporating current flow information can give greater understanding of the battery and charging system, and what influence their loads are having on the system. Noting that everything looks normal and is ok, or that things don’t look right and need further investigation might be all they want to know. Once again, some education here can really help you get the most from your system and be comfortable with it in the long run. However, all this stuff about voltage and current can be a bit daunting for many. Bring on the technology to do the work! Advanced battery monitoring is often integrated into complete battery management systems, and the information is used to provide more accurate results that are easy to understand, covering all aspects of the charger, load, and battery. They use more accurate current-measuring components that can measure fractions of an amp right up to hundreds of amps. Shunt-type current sensors can provide greater resolution and range than inductive sensors and are wired in series with the circuit being measured, once again usually the battery negative lead. Battery construction and size influences the efficiency of battery charging and the effect of discharge currents on state of charge, all of which can be monitored in real time and taken into account by the system. To work all that out around the campfire would not appeal to most! Advanced monitors can do all these calculations and deliver the information in a way that is easy to understand at a glance; just as a vehicle trip meter does with fuel – ‘100 km’s till empty’ (under current conditions) – monitors can report ‘five days till flat’ for your dual battery system.